International Robot Olympiad 2018 Gold winning Project! International Robot Olympiad 2018 Gold winning Project! Team RoboTigers, From Bangladesh. There is two leading Olympiad contest on Robotics going on around the world. One is International Robot Olympiad, which known as (IROC) and other is World Robot Olympiad, also known as (WRO). Both of the Olympiad organizers arrange global robotics competition for young kids. They arrange this Robot Olympiad every year in a different member country. 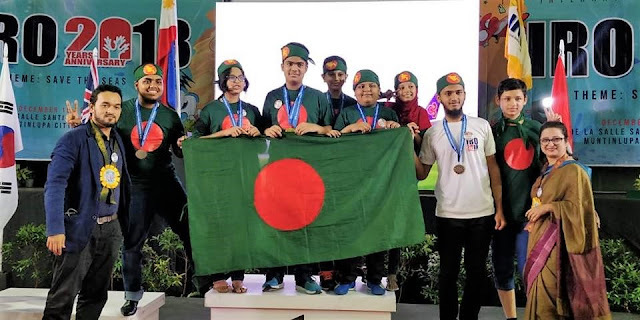 Bangladesh participated for the very first time in IROC Robot Olympiad 2018. They did an extraordinary result. They got the gold medal in Creative Catagory. This is the video Documentation of Serenity Bot By Bangladeshi Team RoboTigers which is the Gold winning Robot in International Robot Olympiad 2018, Philippine. This robot was built for water quality measurement in the sea. The robot is 100% homemade robot with opensource Arduino platform. The robot has GSM module and GPS module on it so that it can send data and also it's real-time location. The robot can measure the PH level and turbidity of the water. As the theme of International Robot Olympiad 2018 was "Save the Seas". Basic Overview of The Arduino Based Homemade Robotics project "Homey The Robot". Now-a-days robots are playing a very important role in the industry level and also out of the industry. Dependency on robots are increasing for their fast and reliable working speed and accuracy. Considering that demand of the robot increasing every day. This research was conducted focusing on the necessity of robots in our daily life. This video documentation shows the system where a robot can be controlled in different ways like voice, wireless and full automatic mode. The prototype was built and tested. The robot prototype will be able to receive voice command from short distance. In case of long distance communication user will be able to connect through internet using Internet of Things (IoT). Plastic board for body structure etc. 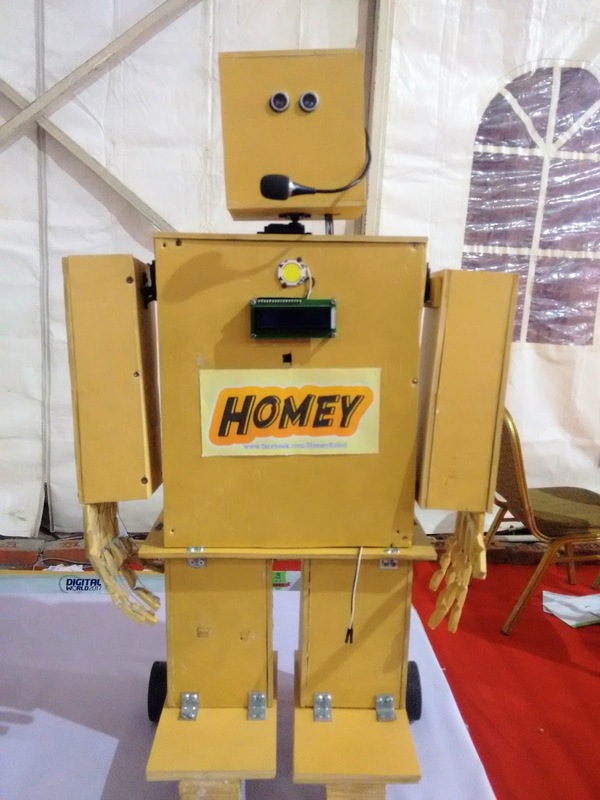 The Homey robot was built based on Arduino Open Source Platform. The robot connects itself with android phone through HC-05 Bluetooth Serial Communication Module. 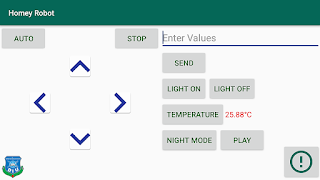 The user can give command using android application. The system can send command and also receive data from the robot. User can observe sensor value from the robot. Another way of giving instruction is voice command. Voice Recognition module (VR-3) was used to receive voice command along with Arduino Nano. 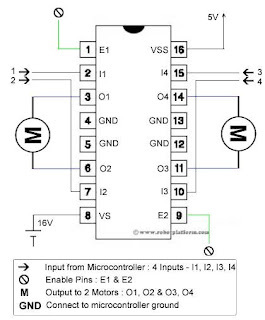 Arduino Nano receive voice command and process it. Then it generates specific instruction for each voice command and send it to Arduino mega through TX RX serial communication pins. Then Arduino mega perform according to the command. Voice training sets are stored in Arduino Nano. Therefor when it receives voice command it process and compare the voice with training data-set. Voice commands are stored in two different groups and each group have their unique voice commands. The voice recognition module takes input command as group. Each group can hold 6 commands. Maximum 255 commands can be trained with the voice recognition module. The robot can be controlled by android application. While user press any button on the application, corresponding commands are sent via internet to the robot. The commands are in the form of ASCII character. 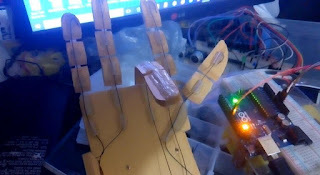 The Arduino on the robot then compare the received command with its pre-defined commands and control the servo motors, gear motors, sensors and other peripherals to move forward, backward, left, right, stop, move hands, fingers or measuring sensor values. 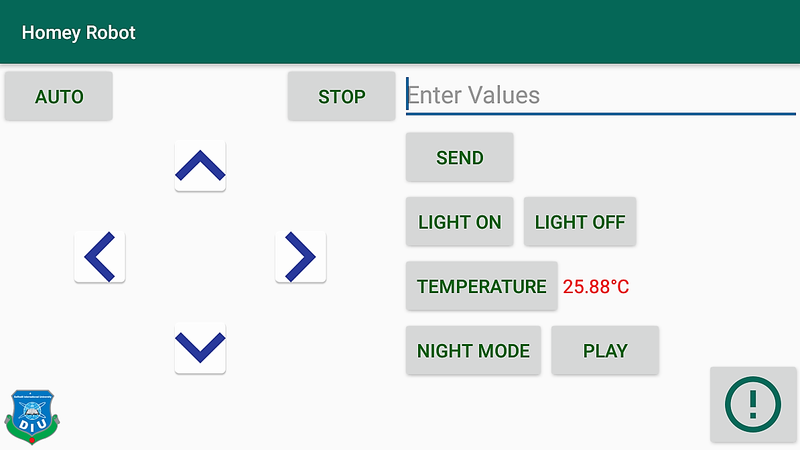 The temperature button send command to Arduino to check temperature sensor value and the value is sent back to the user. Temperature value also displayed on the liquid crystal display attached on the front side of the robot. If the user presses the auto button or gets disconnected from internet the robot can move anonymously. During the anonymous mode sonar sensor helps it to avoid obstacle. The speed of sound in air is 0.034 and it travel twice to return, so divided by 2. The Arduino Mega micro controller get the distance value and check the condition when it should stop and search for another long-distance path. The robot was built as the shape of human. Different body parts like hand, head, and fingers are controlled by servo motors. It also can handshake with human using its robotic arms and pick objects. As the structure is not that much strong, therefore at present it only can pick lightweight objects. If you like the Project, Please share, Subscribe to the YouTube Channel. Before doing the code to find all odd number using c programming, we have to know the logic behind the code. We have discussed the logical part. Now it's time to write some code. But I suggest, please go back to the logical part of the code first. 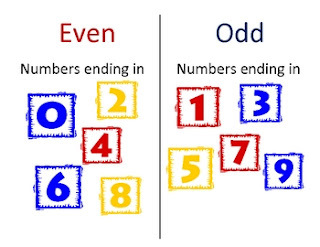 The logical thinking to find odd and even number is the same. Before doing code to find all even number using c programming, we have to know the logic behind the code. We have discuss about the logical part. Now it's time to write some code. But I suggest, please go back to the logical part of the code first. The rule is, if any number is fully divided by 2, then this number is even. Else the number is odd. If we want to check whether the number 5 odd or even, we need to simply divide the number by 2. If there is any reminder left, or if there is any value of 5 mod 2 left, that means 5 is not divisible by 2. So 5 is odd number. How to swap 2 number in c programming? We have discuss about the logic behind this code to solve our problem. If you missed the basic logical part, please go back and understand the logic and then try to code yourself. How to swap 2 number in programming? How to swap 2 number ? variable x holding integer value 5 and another variable y holding the integer value 10. Now we have to swap the position of those two numbers. Some UVa easy problems for beginner. How to print stars( * ) pattern in java ? How to print star pattern ( * ) in C programming ?